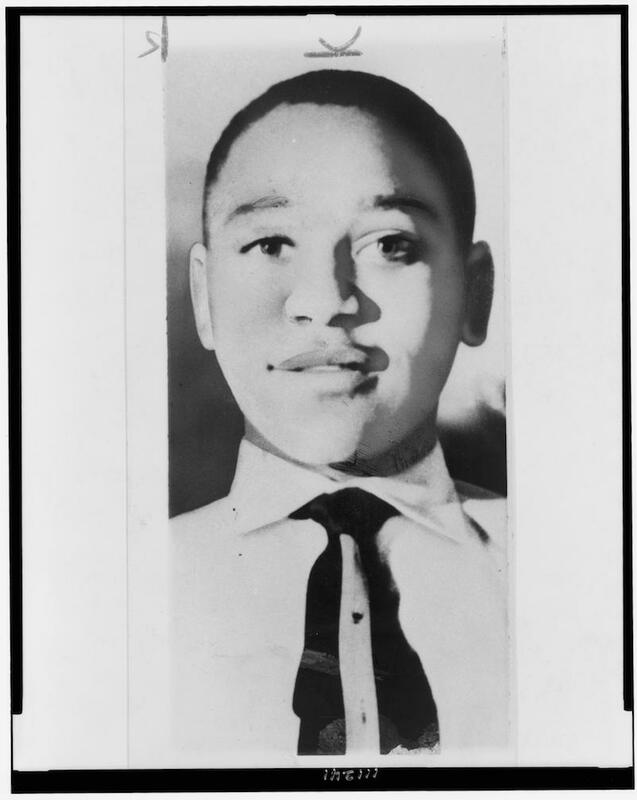 Emmett Louis Till was born near Chicago on 25 July 1941 and was murdered in the Mississippi Delta on 28 August 1955, making him the best-known young victim of racial violence in American history. Visiting relatives during the summer before starting eighth grade, Till accompanied his cousins and other black teenagers to Money, in Leflore County, on the evening of 24 August 1955. There he entered a general store and—probably as a prank to impress the locals with his bravado—allegedly whistled at Carolyn Bryant, the twenty-one-year-old wife of the store’s owner, who was not present. Till’s companions hustled him out of the store and out of Money, but in retaliation for the breach of the Jim Crow etiquette, Carolyn’s husband, Roy Bryant, and his half‑brother, J. W. Milam, abducted Till from the home of his great-uncle, Moses “Preacher” Wright, and his wife, Elizabeth Wright. Possibly with the aid of others, Bryant and Milam pistol-whipped Till (whose name they did not bother to learn) and then murdered him near Glendora. The corpse was tied to a cotton gin fan and then dumped into the Tallahatchie River, where it was discovered three days after the sheriff of Leflore County arrested Bryant and Milam on suspicion of murder. Because the corpse had been recovered in Tallahatchie County, the homicide was presumed to have occurred there, and Bryant and Milam were tried in late September in the county seat of Sumner on two counts of kidnapping and murder. All five of the town’s attorneys who were engaged in private practice represented Bryant and Milam pro bono. Even Sheriff H. C. Strider testified for the defense, which claimed that the corpse was not Till’s (despite the recovery of a ring bearing the initials of his father). Moses Wright courageously identified each of the defendants in open court (“Thar he”) as having abducted Till, whose mother, Mamie Till Bradley, came down from Chicago to testify. On 23 September, the jury of twelve white men deliberated for just over an hour before acquitting Bryant and Milam. The fact that the jury had deliberated that long heartened some observers who discerned progress toward racial justice, though one juror explained, “If we hadn’t stopped to drink pop, it wouldn’t have taken that long.” The trial itself was covered by reporters from the national and even international media, and Michigan Democrat Charles C. Diggs Jr. attended as an observer, to the consternation of locals who had never seen a black congressman. The exoneration of the defendants was widely condemned in the press outside the South and beyond the United States and added to the shock registered when Bradley had insisted on an open casket at her son’s Chicago funeral so that the world could see how his body had been mutilated. The crime—the extremely violent murder of a fourteen-year-old boy accused of doing nothing more than flirting—was more effective than any other incident in highlighting the character of racial inequality in Mississippi in particular and may have quickened the tempo of the civil rights movement. Black activists in the 1960s recalled that Till’s fate brought home their own vulnerability and inspired them to combat white supremacy. The case sharpened the sense of black subjugation and precariousness as had no other and became imprinted in the minds of artists and their audiences. Two major postwar African American novelists, James Baldwin and Toni Morrison, wrote plays based on the Till case (Blues for Mr. Charlie and Dreaming Emmett, respectively). In addition, the murder has inspired poems, songs, fiction, and documentary films.